I went on a week long trip through several of Utah's national parks with my university Outdoor Recreation club for Spring Break. We spent 2 nights at Coral Pink Sand Dunes State Park, driving into Zion each day. Upon arrival we were greeted by a very friendly ranger who provided us with a warm welcome and all the information we needed during out stay. The campsites were all spacious and each had their own waterspouts and picnic tables. This was super exciting since we had previously stayed at a campground without any water access. The bathrooms are fully functioning as well and were a nice change from the pit toilets we had been using. It was a relief to come to CPSDSP and find that we could all shower as well. Basically we were very happy with all of the amenities. The sand dunes themselves are gorgeous and we had a great time sand-surfing and rolling down them. We returned in the middle of the night to do some astrophotography and star gaze. These were probably the best dark zones I've ever seen. Our second night at CPSDSP we switched campgrounds because we had originally only planned to stay one night. However, it was decided that we didn't want to take the chance with not getting a campsite in Zion so we talked to the ranger and he was extremely helpful in making sure we had a campsite for our second night. He moved us to the group site (there were 10 of us in our group) which was fully equipped and even had picnic tables under a covered area as well as a grill that can be used if you bring your own fuel. Overall we had a great stay in the park and I am hoping to come back someday. This campground is quiet and out of the way from nearby Zion National Park. This is a great place to stay if the campgrounds near Zion are booked or you want to avoid the crowd, as long as you don't mind the 45 minute drive if you are going to Zion before or after staying here. The ground is mostly sand, except for the paved parking and driving areas. There are plenty of trees for shade, and a picnic table and fire ring are provided. Modern restrooms and showers are provided, but they are not the cleanest, though they are acceptable for a smaller campground in a secluded state park. The real beauty of this campground is the nearby sand dunes. A short walk from the campground is the pedestrian entrance to the the Coral Pink sand dunes, which seem to go on for miles. There is a small shelter with informational plaques, and a path to where you can walk down to the dunes. Be careful though, because the dunes are very popular with dune buggy and off-road enthusiasts. This place was beautiful and the camp hosts were super nice. Clean bathrooms and nice showers. I really loved the facilities here! the bathroom and showers were so clean and the campsites were very nice and semi private from the other campers! and a fire ring to roast those s’mores!! However, we came in the back way from Zion, which was through unmarked roads, no service, and in the middle of nowhere. Once we were in the park, we felt better, but still no service so just prepare yourself for that. Maybe text your loved ones that you made it before reaching the actual park (but the rangers were nice and let us use their landline). 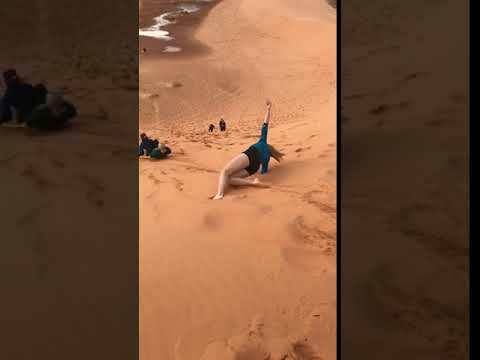 Coral pink sand dunes is a really cool place. Coming from the east coast, I’ve never seen anything like it. The sand dunes are incredible and my pictures don’t do them justice. 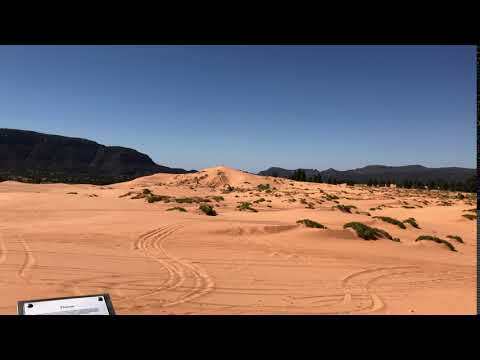 There are lots of opportunities for ATVing and sand surfing. We didn’t try either of those but did joke about 6 miles through the dunes. It was a great leg workout and a neat experience. There are some very nice campsites here. We stayed at a more primitive site but were still able to access the free showers (very much needed after a day in the sand! ), water, and bathrooms. The rangers were friendly and helpful. Upon arriving, check-in was easy with the Ranger at the welcome station. From there, it was a VERY short drive to the campsite. There was already wood stacked in front of our campsite for us to use, and the campground host drove by and introduced himself within 5 minutes of our arrival. The campground was clean, the bathrooms and showers were clean, and everyone was very friendly! As in all campsites, the sites were close together. However, we were lucky to not have any neighbors. As far as I know, the quiet hours are enforced as much as possible, and I wasn't woken up by any ATVs. Also, as a plus, the walk to the dunes to watch the sunset is less than a mile. I HIGHLY recommend watching the sunset from this lookout! Great campground for car camping or RV. The campground is a bit off the main highway, providing for peace and quiet at night. The showers are amazing. There is ATV use in the park, but everyone was respectful of quiet-hours.